Welcome to the CrystalWash Rock Art Site entrance. Stretching out before you along the wash is the CrystalWash Entrance Site. Generally speaking, the panels are sporadically placed and there is very little representational imagery at this site. There is, however, one notable exception (see marker #4). There are also two boulders that are heavily covered with petroglyphs and contrast with the mostly cryptic images found at this site. The placement of these petroglyphs suggests a possible travel route, with the rock art providing information along the way. This would have been a public site since the rock art is easily accessible. There is also nothing to suggest this was a habitation site, however, the occasional lithic flake found in the wash indicate that some stone tools were made here. 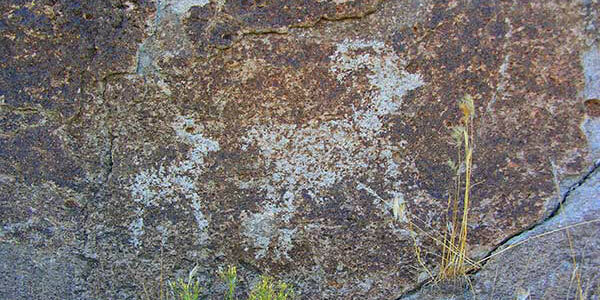 The entrance and gate to Crystal Wash Rock Art Site is 3.7 miles from the intersection of State Route 375, State Route 318 and U.S. Route 93 (the “Y”). Traveling east on U.S. Route 93, towards Caliente, it’s on the left (north) side of the road just past the 54 mile road marker. 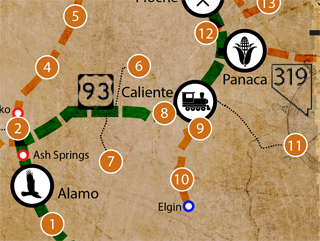 Traveling west on U.S. Route 93, the entrance is 38.2 miles from Caliente, on the right (north) side. There is a BLM marker just to the left of the barbwire gate. Go through the gate and continue about 50 yards to the register. Petroglyphs are the dominant rock art form at CrystalWash and they are etched onto rockfaces by pecking, abrading, scratching, or a combination of these techniques. Pictographs, or painted rock art, is only represented in small quantities at CrystalWash. A third type of rock art known as cupules or pit-and-groove rock art, are cuplike depressions or pits in boulders and are thought to be the oldest form of rock art, first appearing in parts of the Great Basin 7000 years ago. There is one example of this rock art atMarker #6. The Main Site of the CrystalWash Rock Art Site is a large habitation area comprised of a triangular configuration of three boulder groupings inscribed with rock art. It was frequented by the Pahranagats, and this site is large enough to have accommodated a village and is thought to have been a winter site. Water was ordinarily obtained from snow meltoff, and the large boulders provided suitable protection against the wind. This location was climatically more desirable than the lower valleys which were colder during the winter months. Aside from much lithic material and a few ceramic sherds, four hearths and some cobblestone alignments have been found at this site, signifying the presence of wickiups, which were typical camp shelters. During the cold months, less food gathering took place although there was occasional hunting. Instead, winter was a time of visiting, and gambling and story telling were frequent activities. The presence of much debitage, or stone flakes, indicate that many stone tools were created here. These include knives, drills, scrapers, hammerstones, and a variety of projectile points. Tools were fashioned mostly out of cherts and obsidians which were obtained locally. The Pahranagats also had a highly specialized basketry tradition. Baskets specifically fashioned to gather and process plant foods included burden baskets, winnowing and parching trays, bowls, and seed beaters. By contrast, pottery was simple andn utilitarian, although some vessels had cord-impressed or fingernail-incised decorations. The entrance and gate to Crystal Wash Rock Art Site is 3.9 miles from the intersection of State Route 375, State Route 318 and U.S. Route 93 (the “Y”). Traveling east on U.S. Route 93, towards Caliente, it’s on the left (north) side of the road just past the 55 mile road marker. Traveling west on U.S. Route 93, the entrance is 38 miles from Caliente, on the right (north) side. The entrance is at a pullout with white trash can and orange netting behind it, and there is a yellow BLM marker just to the left of the gate. Go through the gate, veer left (not right) and continue .6 miles to the register.